Looking for information about your bill with Central Hudson? Here we give you two examples of typical Central Hudson electricity bills. The first one is an example of an actual bill sent out to a customer in the summer of 2014, and the second is a more general bill simulation on a typical bill that you could receive, based on data from January 2013. Electricity prices are rising each year, so here are a few ideas for taking the pressure off your energy budget. The most effective change you can make is to reduce your overall energy consumption. A lot of the items on your Central Hudson bill are charged on a per kWh basis, so improving your energy efficiency at home can go a long way towards lowering your bills. Another option you can take is to take a look at the rate you're paying with Central Hudson, and see if it can be beat by an alternate energy supply company (ESCO). With electricity markets in New York open to competition, many alternative suppliers can offer competitive rates for electricity and natural gas. To learn more about your options, check out our pages on energy in New York, or call us directly at 347-410-8789 to find the best rates in your area. Rate 150 is a type of Service Charge which Central Hudson offers. To view all the different types of Service Charges which can exist under Central Hudson, go to Service Charge. This is your total electricity consumption (in kWh) from the day of the previous meter reading to the last meter reading (approximately 2 months in this case, from July 1st to August 29th, 2014). Basic Service Charge: this charge is billed whether you use your electricity or not. It includes the maintenance of the electric lines and the reading of your meter by technicians every 2 months. Delivery Service Charge: The cost to deliver electricity to you. This will not change whether you purchase you electricity from Central Hudson or another supplier. MFC Administration Charge: This merchant function charge is charged when alternate suppliers use Central Hudson’s billing system. Customers receiving a separate bill from the alternate supplier will avoid this charge. Transition Adjustment (tax/surcharge): this charge is only billed when customers purchase their energy supply through alternate suppliers. SBC (System Benefits Charge)/RPS (Renewable Portfolio Surcharge) (tax/surcharge): This state charge is billed in order to fund energy efficiency programs, assistance for low-income customers, energy research & development, and also to encourage the use of renewable energy sources. Purchased Power Adjustment: usually a credit (money is given back to you), this charge corresponds to long-term power purchase agreements that exist between Central Hudson and the new owners of its former power plants. Miscellaneous Charges: other credits and charges. One of these may be for example the transaction with the grid operator, if Central Hudson is not the grid operator for that area (but simply the grid owner, and subcontracting the operation of the grid to a third party). NYS Assessment (tax/surcharge): a state charge to recover the Temporary State Energy & Utility Services Conservation Assessment. Revenue Decoupling Mechanism (RDM): this charge is made to minimize the financial impact to utilities caused by lower sales as the utility implements energy-efficiency programs that help customers reduce electricity consumption. This is the portion of your bill that pays for the actual electricity itself. This will only go to your utility company if you do not choose to switch to an alternate retail supplier. If you do switch supplier, the supplier's charge will still appear on this bill for convenience, but the rates proposed (here rate E150) will be different. MFC Supply Charge: A charge for the company's cost to procure gas or electricity supply. The Company will not bill you this charge if you choose an alternate supplier. Market Price: this price is billed by your supplier, which will by default be Central Hudson if you do not choose an alternate supplier. With Central Hudson, this price is based on the average market wholesale price of electricity for the previous month, as well as an estimate of the next month. This is to enable the customer to have a prediction in advance of how much he will pay at the end of the month. Indeed, for a bill arriving at the end of the month, this market price will already be available for information on the 10th of the month. Market Price Adjustment: If the actual market price at the end of the month ends up being different than the estimated market price, an adjustment will be made. If the estimated market price forecast (published on the 10th of the month) was 9cts/kWh and the price at which Central Hudson actually purchases the electricity over that whole month is 10cts/kWh, then the market adjustment will be 1ct/kWh. These are the Taxes and other surcharges you will be paying to New York State. This is the total payment you must make to the utility company for the 752 kWh of electricity you have used in the 2 months since the last bill. If you divide that by the 752 kWh, you will get a value of how much you pay in total per kWh: 0.2105$/kWh. 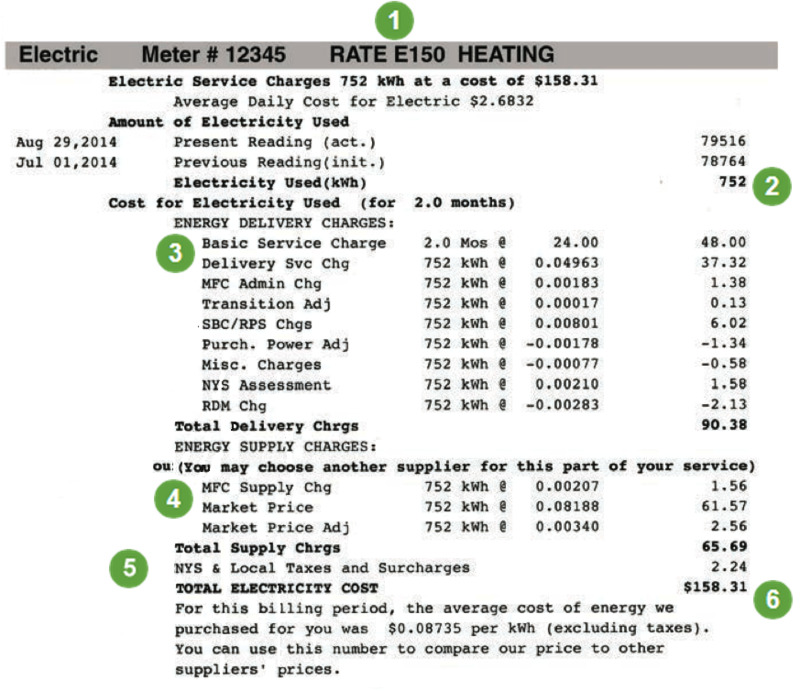 The price per kWh in the last paragraph (0.08735$/kWh) corresponds only to the supply portion of the bill. If you are interested to know the difference with other New York State utilities in these 3 types of charges, please go to New York State Electricity Bills. Let us calculate the electricity bill for an average New Yorker with a Central Hudson account. The average electricity consumption in New York State is 530 kWh/month. Here is an example of a typical electricity bill you could have received in January 2013.